During the reign of the Tetrarchs (A.D. 284-312), rule over the Roman Empire was divided among four men, each responsible for different regions. Most of the surviving portraits of them are carved in porphyry, a hard, dark stone that is difficult to work. The resulting sculptures were often blocklike in style, far removed from physical likeness. This portrait is thought to represent Diocletian, one of the Tetrarchs, who ruled the region from Thrace to Egypt for more than twenty years before he abdicated in A.D. 305. 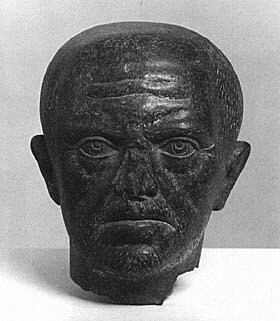 Carved in basalt, a material similar to porphyry, the forceful, cubic head shows features characteristic of the emperor: furrowed brow, lined forehead, and expressive, enlarged eyes conveying tension and concern. The downward curve of the mouth suggests a tough and resolute man whose advancing age is apparent in his sunken cheeks and receding hairline.